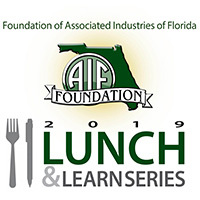 The Foundation of Associated Industries of Florida (FAIF) was formed in 2008 to address the education and development needs of Florida’s business community. Florida businesses cannot afford to rely on public opportunities alone to train and prepare their future employees and leaders. FAIF fosters programs that identify business needs today and create solutions that will last into the future. FAIF focuses on the specific issues that are important to the prosperity of Florida employers as well as educating the public at large about these issues. The Foundation targets specific issues that are current and are part of the ongoing discussion of how to make Florida a better place for its businesses and citizens to call home. FAIF is a 501(c)(3) organization. Registration Number: CH28665. A COPY OF THE OFFICIAL REGISTRATION AND FINANCIAL INFORMATION MAY BE OBTAINED FROM THE DIVISION OF CONSUMER SERVICES BY CALLING TOLL-FREE (800-435-7352) WITHIN THE STATE. REGISTRATION DOES NOT IMPLY ENDORSEMENT, APPROVAL, OR RECOMMENDATION BY THE STATE. FAIF may use a percentage of your contribution to support required administrative costs, direct costs, and/or activities.